My next station is one of the least used on the Overground, on the line out to Watford Junction, and I've written about it before. 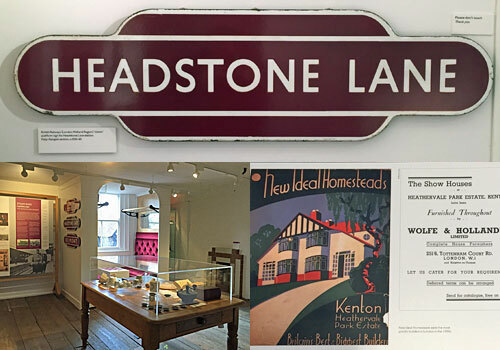 On this visit I was planning to tour its catchment, walking the quiet suburbs of Harrow Weald, but instead I discovered London's newest museum and spent all of my time there. At odds of 589 to 1 against, that's reason enough to love this random challenge already. The first time I visited Headstone Manor, in 2008, it was sealed off on its island for urgent renovation. The second time I visited Headstone Manor, in 2013, I went on an eye-opening tour round an empty crumbling relic. Third time lucky. 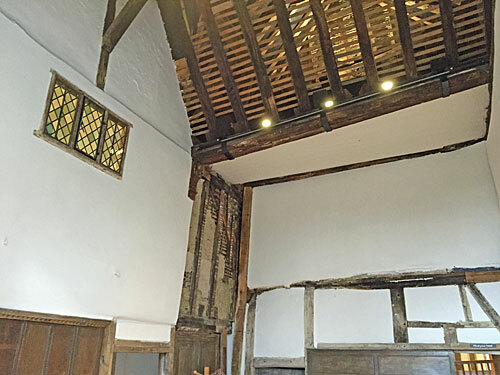 With the aid of a £6m lottery grant and a lot of volunteers' goodwill, the oldest surviving timber framed building in Middlesex reopened in December, triumphantly restored. The manor was built in 1310, back when the Archbishop of Canterbury owned the land, and is encircled by a proper moat of the same age. Henry VIII owned it for all of eight days, before selling it on, and a succession of wealthy families, then farmers, followed on. 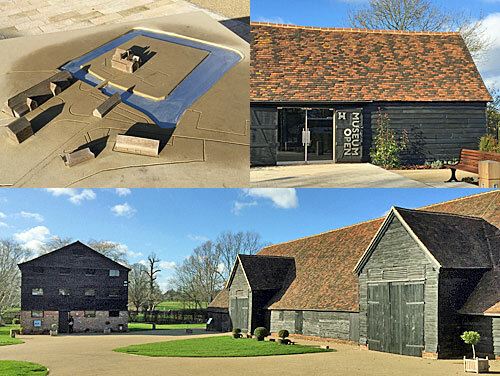 Harrow Council eventually ended up in charge, and in 1986 opened a museum here, shifting this into the Great Barn when the need for urgent repairs became apparent. As museums went it was disappointingly lowkey, I thought, but this latest revamp has worked wonders, and highlights not just the history of the site but of the borough. Entrance is through the Small Barn, again lovingly-scrubbed. Harrow's story is told in an introductory video - short enough to be engaging and informative enough to make residents proud - and a few prehistoric finds are displayed up the back. 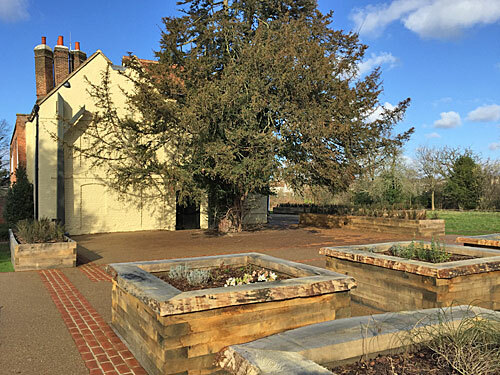 Stepping out into the main courtyard you'll see the Great Barn, currently being used as a store but soon to be readied again for hire, should you have a summer wedding or celebration you'd like to host in a characterful space. 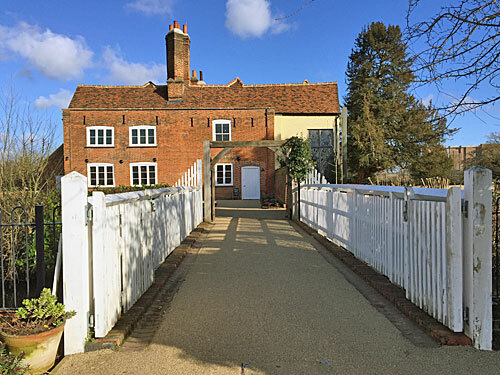 The two-storey Granary contains agricultural implements and various family-friendly activities, and is yours to explore so long as a school party isn't doing its thing. But for the main action, head across the moat via the low-arched bridge, and maybe wave at the ducks as you pass. The true age of the building is initially shielded by a layer of bricks added by one of the later owners, but various shaky timbers and uneven floors can be seen once you're inside. Having walked round five years ago when surfaces were ropier, and various rooms sealed off lest we put our feet through the floorboards, I was impressed. The parlour is now a meeting and greeting point, and then a trail leads round a warren of rooms upstairs and down. I was surprised that the chosen route works backwards through the history of the place, but I suspect that's to leave the surprise of the biggest room until nearer the end. Several former residents of the house 'narrate' their story, from the Tudor lady of the house to the farmer's boy watching semi-detached homes rolling in on every side. There is a really nice feature in the Metro-land room where maps of the locale in 1913 and 1935 roll down automatically over an 1895 map of almost entirely fields. As is usual in London the railway was to blame, and the arrival of the London to Birmingham is covered elsewhere, including how it encouraged cookery writer Mrs Beeton to move in and commute. Various local businesses are showcased, most notably Kodak whose UK factory was at the end of the road, so expect Box Brownies aplenty. Whitefriars Glass moved here in the 1920s, the fire in their furnace originally lit in 1680, and cabinetfuls of their gorgeous decorative ornaments can be found in one of the upper rooms. Hamilton & Co made brushes in Harrow for a century before they decamped to Attleborough in Norfolk, and Winsor & Newton still made paints around here until relatively recently. But mostly the museum tells the story of a house, reflecting turbulent times and workaday ordinariness combined. All sorts of old wallpapers were uncovered in the restoration, lined up on one downstairs wall for you to peruse. 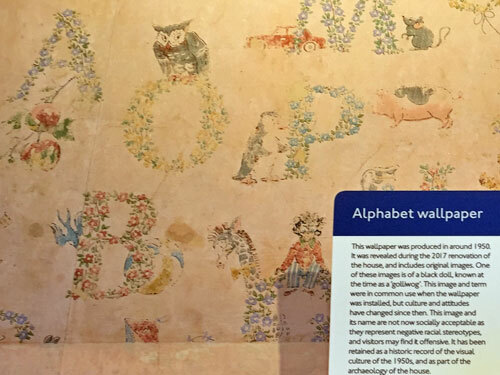 The alphabet wallpaper in a child's bedroom upstairs isn't quite so ancient, but has to come with an explanatory note that the golliwogs represent negative racial stereotypes and are not now socially acceptable. Small visitors will enjoy pretend cooking with plastic vegetables in the bakehouse at the rear, while tall visitors should mind their head on the way down into the Great Hall. What remains is merely the end slice of the original room, which stretched out into what is now the garden, but a sense of its lofty timbered importance remains. The restored manor and its environs are an amazing resource, and all the better for being so readily accessible. That Heritage Lottery grant made it a condition that the place be free to enter, six days a week, which in this day and age I'd say is remarkable. Such opening hours do require a tireless body of volunteers, however, should you be local and retired and in need of philanthropic direction. The gardening team have thousands of spring bulbs ready to plant, for example, and then there are the May Day celebrations to plan for as the building leaps back to life. One added extra is the visitor centre deftly positioned just outside, in a building designed to mimic one of the adjacent barns. 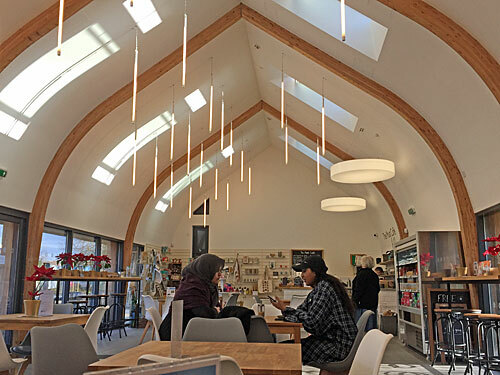 It's bright and airy, and open daily, and was turning out jacket potatoes and hot drinks even on a weekday in early February. I felt so guilty that nobody had charged me any money for everything I'd enjoyed that I even made sure to sit down with a nice cup of tea and some cake. The full set of nature trails and leaflets was worth the millionaire's shortbread alone. 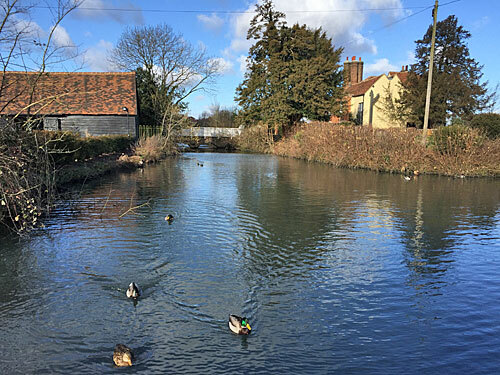 If history's your thing, or you have family who'd enjoy an interactive moated toddle with ducks, head for Headstone.